BEFORE: Real Steel is next on the list. I’ve heard many great things about this movie but I don’t have much to say myself so I’ll just get right into watching mode. I pretty much covered the story already (read: a textbook underdog story) but I’d like to elaborate a bit. Yes, the story may be old, unoriginal, and predictable, but that doesn’t mean it’s bad. Everyone loves a good underdog story. Who doesn’t want to see the little guy win even though all the odds are against him? 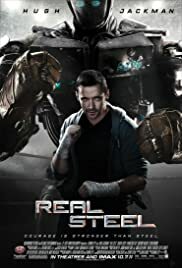 And Real Steel tells the story well: it has lively characters, excellent pacing, and some emotion sprinkled here and there. Speaking about lively characters, lets talk about the acting. I don’t know what’s going on, but there are some top-notch child actors these days. In the past couple years we’ve seen the talents of Pierce Gagnon in the new release Looper, Asa Butterfield of Hugo fame (and the upcoming Ender’s Game adaptation), and now today’s Dakota Goyo who plays Max Kenton, Charles Kenton’s (Hugh Jackman) son. This has got to be one of the coolest kids I’ve ever seen. The swag just flows out of him as he trains and dances with Atom, his fighting robot. And the chemistry between him and his father is great. Jackman and Goyo just click and it’s very apparent in their actions and expressions.